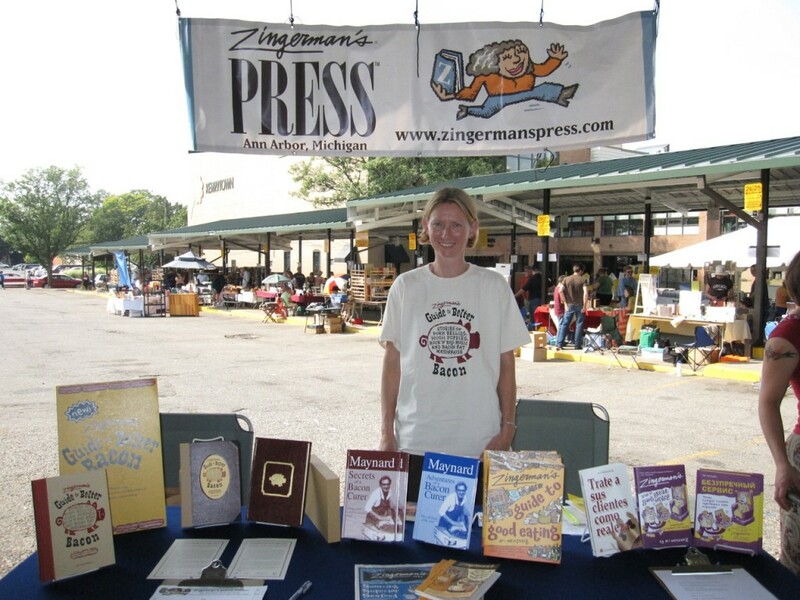 At the Zingerman’s Press table I was showing off the brand new pigskin-leather-bound edition, with its linen case (both made here in town by Bessenberg Bindery, the first one of only twenty), and the new cloth edition too, the case for which was also hand made by local book artist Jean Buescher Bartlett. And as usual the Russian edition of the Guide to Giving Great Service caught lots of peoples’ attention! Saturday, September 5th, was International Bacon Day. 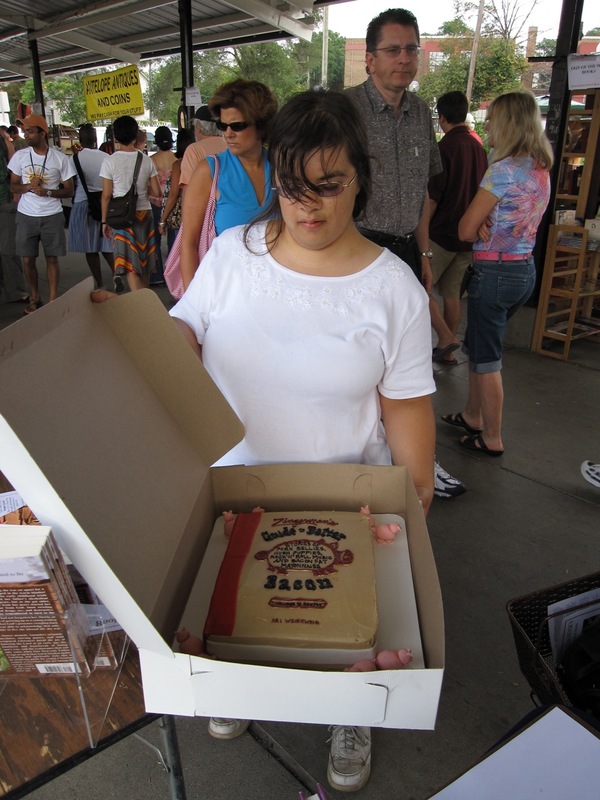 I’m sure there were bacon events around the world; I did my part by heading down to Zingerman’s Deli, to buy a pound of artisinal Edwards bacon, and I got a free Edwards Bacon baseball cap, too! Predistressed. 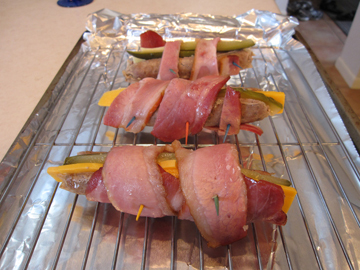 I had some pepper bacon in my fridge already, too, so its a bacon-cooking weekend. 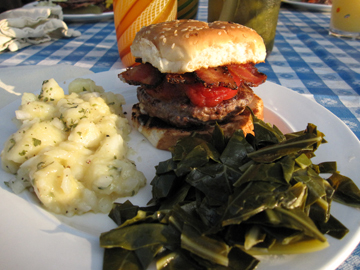 Friday night we made hamburgers and topped them with the peppered bacon. And Saturday night, we made a variation of a recipe from the book – Wittenberg Splits. 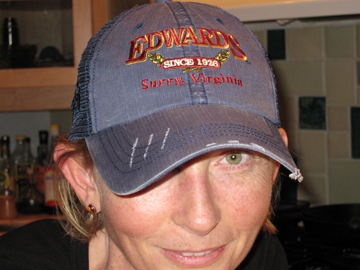 With apologies to Tanya Nueske – we used the Edwards Bacon! And some Michigan-made pork bratwurst instead of all-beef franks. So we cooked the bacon a little bit, in an iron skillet, removed the bacon, then cooked the brats in the skillet (since they were not precooked like a hotdog would have been). 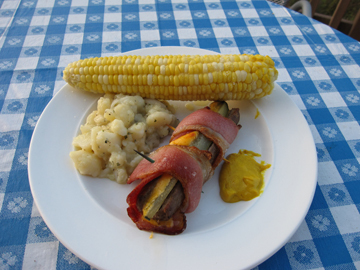 Then we split the brats, put in slices of sharp cheddar and sour dills (homemade – one thing I really enjoy canning every year is my own dills), wrapped them in the slices of Edwards bacon and broiled for a few minutes. Was really tasty. We joked that it seemed like something Elvis would have eaten.